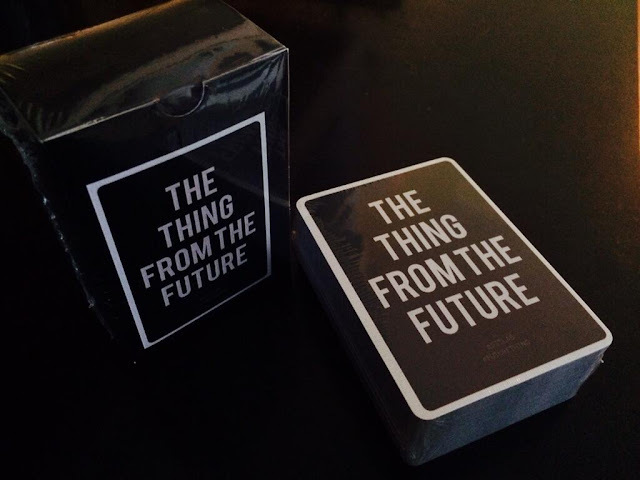 The Thing From The Future is an imagination game that helps players generate countless ideas for artifacts from the future; to amuse, delight, explore, and provoke. Designed for play by individuals or groups, this hybrid party game and creativity tool has been compared to Cards Against Humanity and Oblique Strategies. It's easy to hack and customise, so can be used for exploration in specific domains, or in random-access mode as a gym for the imagination. as well as at any number of parties and kitchen tables, and inside countless organisations from community arts groups to Fortune 500 companies. Co-designer Jeff Watson and I published The Thing From The Future through Situation Lab in March 02014, and we have been refining it continually since. A revised edition, containing four times as many permutations as the original, was released last October. The project was recognised this year by the Association of Professional Futurists (APF) with a Most Significant Futures Work award. I wrote an article about the game for the APF periodical Compass in April, and then revised that piece for an anthology on Methods which came out this month. The text looks under the hood at how the card deck's four-suit structure scaffolds players' imaginations. To reiterate a key point made there: The Thing From The Future comes against a backdrop of increasing interest over the past five years in hybrid design/futures practices such as design fiction and experiential futures. The game takes a certain kind of intellectual and creative operation (viz. quickly moving from vague notions about alternative futures, to ideas and stories revolving around specific artifacts) that has so far been relatively specialised and unusual, and renders it accessible and fun, thereby in a modest way helping to demystify and democratise futures. As the game becomes more widely known, the novelty of the "artifact from the future" premise will wear off. This is a good thing. People ought to be less apt to be impressed by that concept in itself, clearing the way for a more futures-literate interest to develop around the substance of the ideas themselves. It would be good for the field and its underlying goals if more of us were able to be curious, critical and demanding about what makes certain future narratives, and their experiential manifestations, worthy of attention. Thus the practice shifts to its next level of maturity. A larger corpus means a proportionately larger number of projects with something to say. Meanwhile, the game provides a fun entry point, without requiring anyone to engage explicitly with such state-of-the-union practitioner concerns. This post is prompted by two things that have happened in the past week or so. First, we at Situation Lab have just launched a free, downloadable, print-and-play edition in Creative Commons (BY-NC-SA) that anyone in the world with a computer, web access and a printer can now use. The INK Conference in Mumbai provided an excellent platform from which to announce this news and bring the project to a wider and more international player base. Second, we have put out two special online shufflers to support participants in the United States Department of Arts and Culture (USDAC) national grassroots campaign #DareToImagine, described here. To download the inaugural Print and Play edition, including Playsheets, go here. The revised edition of the game deck, containing over 3.7 million possible prompts, is still available for purchase here.